So this past weekend I attended the bi-annual Western Martial Arts Workshop in Racine, Wisconsin. 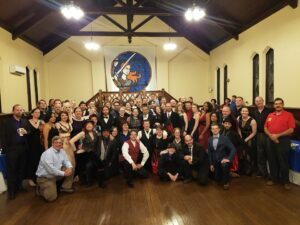 Hosted by the Chicago Swordplay Guild, this is one of North America’s oldest European swordplay and martial arts events. The weekend features workshops, social activities, a feast, and copious amounts of free sparring and sharing between attendees. It’s also held at a former neo-gothic seminary school so the setting is amazing! There were a lot of special highlights this year that I thought I’d share. This year the palette of classes was not purely European, which I think was refreshing and exciting. Manouchehr Khorasani returned to offer workshops on Persian shamshir (a single-handed curved sword) and war wrestling (super intense) and Da’mon Stith offered classes on Burbur sabre and the Ethiopian shotel (another curved sword). These are arts that undoubtedly had an influence on, and were influenced by, European martial arts. I particularly enjoyed my conversations with Da’mon about the rigour he has to go through to rebuild these historical arts from frescoes and other artistic depictions, components that are contained within traditional dance and ritual, and oral history of their practice. 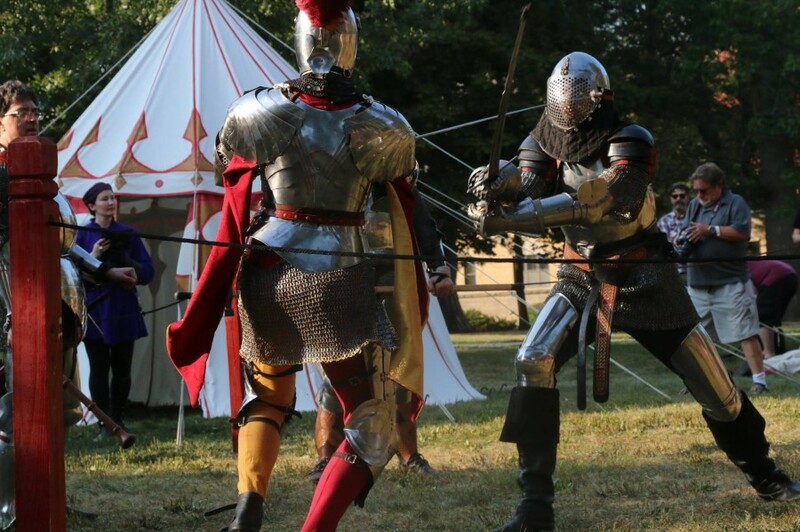 Over the past few years WMAW has featured an armoured combat track with workshops on fighting in proper plate harness and employing traditional techniques with swords, axes, and spears. Part of this track involves a deed of arms where a group of knightly challengers (the tenans) engage in combat against worthy opponents (the venans) with the rest of the event as audience. This year the theme was Italy vs the world. All of the Italian technical practitioners (me among them) faced those who practiced within the German school and two Persian armoured combat guests! The whole thing has great fanfare and the purpose of the event is to show great skill within an environment of honourable combat. I was impressed with the overall high level of skill, the joy of the combatants, and the variety of approaches. I particularly enjoyed my fight with the opposing team captain, Scott Farrel, from Swords and Chivalry in San Diego, CA. He faced me at spear and I really enjoyed the play of feint and counter-feint, and a few great wrestling moments that included me nearly getting his dagger out of his own belt before he grabbed it with a beautiful offside draw. One of the things I most love about this event is all the opportunities to spar with people from all over the world each day with a wide variety of weapons. 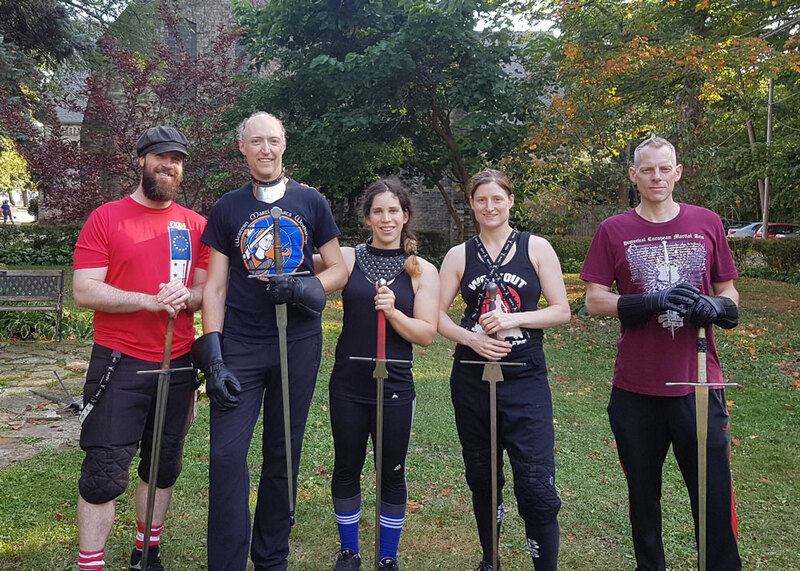 On the opening day I spent time in the green fighting at longsword (thank you Jake, Shanee, Kate, and Thayne! ), then held the field with rapier for over 120 matches against opponents with weapons including rapiers, spears, longswords, and sideswords. Later in the weekend I fenced at sword and buckler, many times in armour, and had an amazing time doing sword and rotella (a large arm-strapped round shield) with Tim Rivera. I particularly appreciate the control and an appreciation for doing the art well that I felt from all my partners. Thank you everyone! I also had an amazing time teaching and sitting in on the classes of others. I was impressed, as always, with the eagerness and quality of my students. The feast featured great demonstration bouts as well as music and merriment. I caught up with many friends I see regularly, those I have not seen in years, and made many new ones as well. 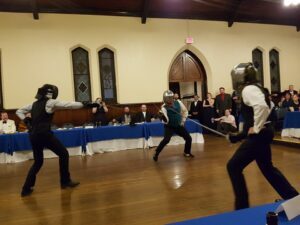 A particular thank you and congratulations to the organizers of the event at the Chicago Swordplay Guild: Greg Mele, Nicole Allen, John O’Meara, and Jacques Marcotte. Superb job! Keep your eyes out for next year’s off-year event at the same site that will be focusing on the Bolognese (sword and buckler, spadone/great sword, two sword, and more, all from the beautiful city of Bologna). You can read more about it and WMAW on their website wmaw.us. ← Why Do We Fight?